Over the last few years, public safety agencies have moved from experimenting with small drones to integrating them into their everyday toolkit. Across the globe, police and fire departments, search and rescue crews, hazmat teams and emergency responders are all finding ways to improve the speed, accuracy, cost, and efficacy of their operations by using drone technology. Some of this work was highlighted at at the AUVSI Humanitarian Awards in Denver, and in our recent More Lives Saved Report, which chronicled the dozens of people rescued with drones over the course of a year. DJI is also working with organizations like European Emergency Number Association (EENA) to develop standards which can help to spread this life saving technology. And we spoke with a HAZMAT team in Florida that’s exploring how drones can aid in some of the most dangerous situations face by emerency first repsonders. 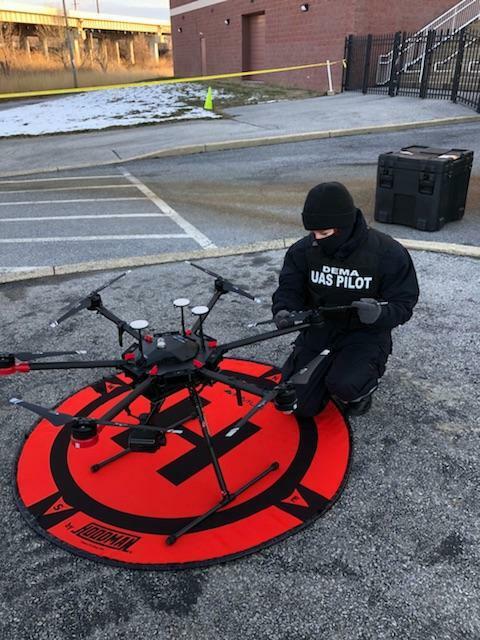 As part of our ongoing dialog with the brave men and women working in public safety, DJI chatted recently with Paige Fitzgerald, who leads the drone program at the Delaware Emergency Management Agency. She shared the story of her introduction to the technology and detailed the myriad ways her agency has been using drones to assist in critical missions around her state. How did you get into drones? How did you became the lead for DEMA’s UAV initiative? Our agency began laying the groundwork for a program in early 2016. My former supervisor created buy-in for the program, developed potential use cases, and created the excitement that we needed to bring it all to fruition. A committee dedicated to examining UAS use in Delaware was instrumental in bringing a structured training program into the state, and he had the foresight to get us involved in that from the start. When he left the agency, the opportunity to be the UAS program administrator landed in my lap by chance. Our approach to public safety UAS use in Delaware is pretty unique in that both state and local agencies train together and use a common operating platform, so I have a large group of people to consult when needed, so even though I came to the table with minimal experience, I’ve been lucky to learn from an experienced crew of people who have really helped get me up to speed. Wilmington Police Department in particular has had a program for four years now, so my learning curve hasn’t been as steep as it should have been. Both our agency and statewide programs have progressed incredibly since their inception, and I’m proud to be a part of both. What was your first big deployment? What did you learn from that? Pretty soon after we started statewide training, we got our first big call out. There was an incident at a prison and the tactical teams there needed constant aerial support to keep situational awareness and help inform their operational decisions. Traditionally, we’ve had to rely on helicopters, which in addition to being incredibly expensive, take those aircraft out of service for other life saving missions. People knew that the public safety UAS program had started, so they asked us to come in. It started with just two pilots and two aircraft, but the first team in recognized pretty quickly that this would become a long duration mission and began calling other pilots from our training program. We faced a lot of logistical challenges that night. It was below freezing. We were new to getting our video feed into the decision makers in the command post without latency issues. We were burning through batteries and generating data like crazy. It was mixed use airspace. It was nighttime. We were operating in incredibly close quarters with tactical teams and equipment from more agencies than I could ever name. There were batteries plugged into every conceivable power source. We definitely learned that flying is just a small piece of the puzzle and that logistical support and crew resource management is paramount. But despite all the challenges, we had no major issues. It really proved to us that our joint training program and decision to use a common operating platform paid off. We flew in mixed agency teams with unfamiliar crews and were still able to communicate and operate seamlessly for the duration of the mission. It didn’t matter who was law enforcement or transportation or emergency management or corrections; it was an equal playing field. Eight of us ended up flying 67 sorties over 17 hours that night, so it was quite a start. View of Fort Delaware captured by drone during structural inspection of new solar panels. What are some other interesting examples of how drones are improving or transforming your work? We’re still finding new uses all the time. The biggest advantage of UAS for us in public safety is that we can perform the functions that we need to without putting responders in danger, usually at a way lower cost than any other technology. You can do remote sensing for hazardous and radiological materials without sending a human into a danger zone. We can inspect dune erosion and damage in minutes. We were able to document damage along a coastal trail that we couldn’t access but needed to validate and verify, so the drone allowed us to see exactly what happened, which in turn allowed us to qualify for federal funds that we would have otherwise missed out on. We’ve been able to provide situational awareness for responders at our state fair to ensure that planned ingress and egress routes for emergency vehicles remained open. A field team who was working with the National Weather Service was able to instantly see the difference between areas of straight line winds and areas of rotational debris patterns, and in turn, instantly confirmed the touchdown of a tornado. Our fire service has benefited from the advances in thermal imaging and have used the technology in two separate industrial fires and could help direct waterflow exactly where it was needed without any guesswork or wasted time. We worked with the Coast Guard to inspect buoys in a shipping channel that had been damaged by ice hours before a boat could get to them, which decreased the time they were down for repair. We’ve run exercises to make sure we can operate with the National Guard and their manned aircraft during incidents. We were able to coordinate our efforts with a swift water rescue team to assist in a search and rescue along a river, allowing responders to cover the search area in half the time it would have taken without the aircraft. We had a really interesting use case last year where an EOD (bomb) team was unable to place a breaching charge effectively utilizing only the camera on their robot because of the angle and light, but the drone was able to come in and provide the needed perspective. A tech ended up Facetiming the drone feed from the command vehicle into the EOD vehicle so they could direct the placement and ended up with a successful breach. Again and again, we’ve found ways to save people, time, and money with our program, and I’m so excited to see the progression continue. 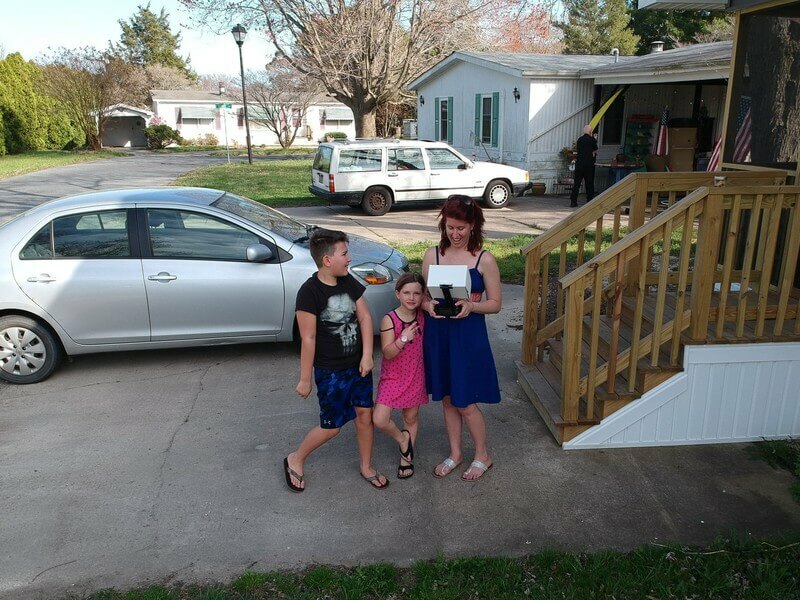 Fitzgerald flying a DJI spark with her family. Do you use drones as a civilian? Where do you see this technology heading? I have a Spark that I fly for fun and my son has a cheap racing drone that he lets me borrow when I’m lucky. My kids are probably way better pilots than me, but it’s fun to have something we can do together (and something I do that they still think is cool). I’ve done some commercial work and lots of contracted training, too, but I’m still learning all the time. The community involved in UAS, especially in online forums, is invaluable. I see this technology becoming as ubiquitous as cellphones. It’s become so easy to use and to use well, that the growth won’t slow down anytime soon. Even my parents have learned to fly at this point. There are so many areas in the U.S. where we’ve barely begun to scratch the surface of their uses, like agriculture and inspections. Last week alone, I sat in on a webinar about thermal mapping and another about advanced methane detection sensors. The technology is mind blowing. I think we’ll keep seeing success stories in public safety and industry that will help to normalize drone use until we can’t imagine doing our jobs without them. Read more stories about how drone technology are making great contributions to their communities and the environment in our #DronesForGood series.